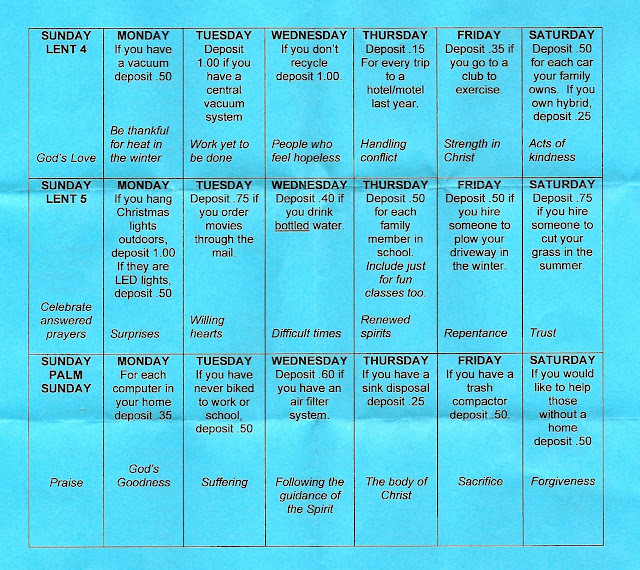 As part of our observance of Lent, our church gives each family a calendar and a small container. Each day has two things listed. 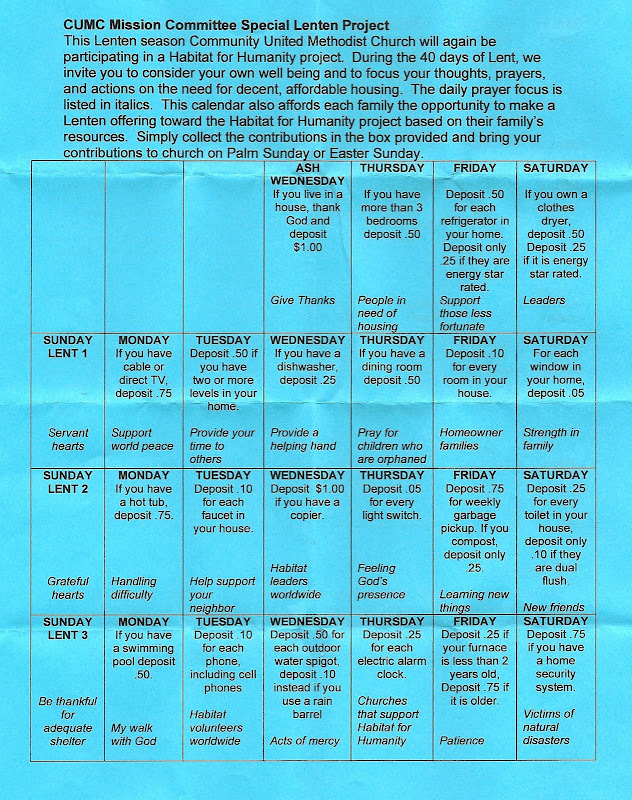 One is a daily prayer focus and the other is something related to our housing, or other things we may have been blessed with, as well as a small donation amount for these items (for example, if you have cable tv deposit $0.75). You place the donation into the container and return it to church on Easter Sunday. All monies are then donated to Habitat for Humanity. This is our second year doing this project and I love it for so many reasons that I had to share. I really feel like this is a great way for children to understand the Lenten season. Each day you are guided to discuss something you have been blessed with and also others who do without. We watched the donation money grow (I believe in the end we collected about $35) and discussed how it would help people with great housing needs. In addition, the learning benefits are also huge. Last year, Jack was able to master coin denominations and math with money. Also, he and EJ really enjoyed counting up all the things in our home from windows to doors to light switches. They thought the computer & smart phone days were fun too (especially because Matt was working two jobs at the time so he has 2 of everything in those categories as well as his personal cell phone). Every night at dinner we had a few more things to talk about, share & have fun with, and pray for...and we were very glad to see the containers appear at church again last week! I've included scans of the calendar below (please let me know if there is something you can't make out). 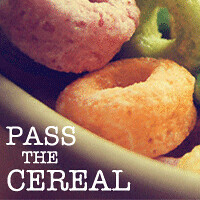 I hope you might incorporate this (or something like this) into your family's Lent observance. It's a great reminder of all the blessings we each have...large and small. I was looking for family ideas for Lent, this is perfect and has perked a few other ideas in my head too!! Thanks for sharing!